Why Trim The Nails of Your Dog? Finding the best dog nail clippers can make a lot of difference in both the way owners look at this often difficult process and in the amount of care that your pets receive. Most people tend to find this activity tedious due to how difficult some clippers are to use and because most of these aren’t made from the quality materials and lose their sharpness after only a few uses. However, there are always ways to improve the situation. One of them is to choose premium high quality tools that will allow you to be both precise and fast. While dogs’ nails usually wear down while they’re running on hard surfaces such as concrete or large rocks, things tend to get a bit more complicated when they are confined indoors or in spaces with nothing but grass. This can be problematic for a variety of reasons, one of the biggest being that they can harm themselves when they scratch or play. Apart from the fact that their nails will not wear down at all, the dogs will also unwillingly scratch indoor surfaces and furniture. Furthermore, dirt and bacteria can also get stuck more easily on long nails and, in time, can cause them to become infected, thus putting your pet’s health at risk. There are many techniques for doing this and it largely depends on the size of the dog. However, the most important thing is to always try to cut as little as possible. If you cut too much of the nail, you may cause a nail bleed, as dogs’ nails contain blood vessels and nerves. It is always better to make several shallow cuts than to make a larger, hasty one. A good way to avoid this issue is to use razor sharp clippers that have a built-in sensor. These tools are designed in order to provide a way to set the amount of nail that will be cut. However, if you do cut too much, then disinfect the area as quickly as possible. In terms of holding your dog, you should first pick a moment when the pet is calm or tired in order to minimize the risk of unexpected movements. Once you’ve identified the right moment, grasp the dog’s foot in the palm of your hand while the pet is on its side and gently start trimming the nails. Also, consider using treats in order to keep him calm. Try to move quickly as the dog may not have the patience to remain in this position for long, but do not make sudden moves as you might scare your pet. If you see that the dog feels pain then stop immediately and allow him time to recover. Insisting to cut his nails when he’s not in the mood will make him associate the experience with pain and discomfort and there’s a big probability that he won’t be cooperative the next time. Luckily, as time goes by, more and more companies start paying attention not only to the needs of the owners but also to those of the pets and strive to build easier to use products. Nowadays, clippers’ blades are built from medical or industrial grade stainless steel, and they feature various accessories which are designed to make the entire experience easier and more enjoyable for both the owner and the dog. While there is no perfect tool for this job, there are products that come from manufacturers who either have decades of experience, or who have decided to express their love for their canine pets through exceptional build quality and great features. 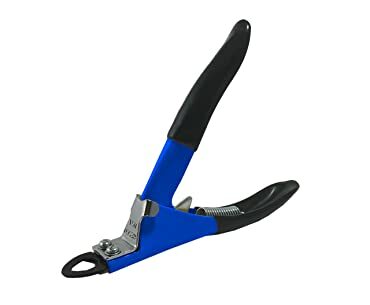 We have taken it upon ourselves to research the various brands in order to bring you one of the most detailed guide of all the available dog nail clippers reviews. The products that we have chosen are suited for dogs of all sizes and have been designed with ease of use in mind. Also, we have included items for different budgets and different situations. 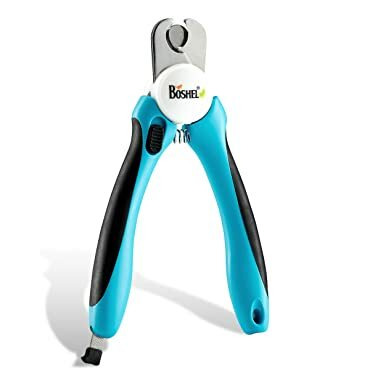 One of the most user friendly products of this type, Boshel’s clippers have been designed in order to insure that you don’t overcut your pet’s nails, thus causing a nail bleed. Its 3.5 mm stainless steel blades deliver extremely clean cuts and will stay sharp for hundreds of uses. If you’re not used to trimming the nails of your pet then you’ll find this dog nail clippers with sensors invaluable. Its integrated technology will make it impossible to cut too deep and to harm your dog. The sensor practically stops the user from pushing the dog’s nail to far into the clipper. While this is usually more useful when dealing with smaller breeds, it can be equally important when having to trim the pet’s nails as fast as possible. From the point of view of the owner, these clippers are surprisingly comfortable to hold and use. Also, they come equipped with non-slip handles that fit perfectly in your hand. As an added bonus, Boshel has also included a nail file that pops out of the handle. While some may not see its usefulness, when the need arises it’s better to have one at hand than have the dog’s nails get caught in blankets and carpets. In fewer words, the trimmer is well designed, using high quality materials and you certainly get a lot for the money it is being sold for. However, it is a bit more expensive than some of the other products on this list. 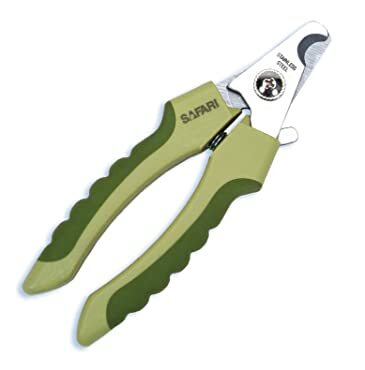 We had to include the professional dog nail clippers from Safari. Their extremely sharp stainless steel blades make cutting nails extremely easy, and the built-in safety will ensure that the owner cannot cut a large enough piece in order to harm the animal. Safari offers their product in two sizes, small-medium and large, with the former being perfect for both small dogs and cats. While the clippers don’t come with a nail file, they do feature a locking mechanism that can lock the blades in place in order to prevent accidents. The Safari Trimmer doesn’t have any bells and whistles, but it does fulfil its purpose and it is extremely durable, making it the perfect choice for all those who want a simple yet effective tool. Unfortunately, the safety stop that it features is a bit impractical. The system only provides two positions: “on” and “off” . While this concept is extremely useful for those who don’t have a lot of experience, it may make the veterans of nail trimming loose their patience due to the fact that it forces the user to cut bit by bit until the desire length is reached. This is a great product for those who have dogs of different sizes, or for those who also have cats and don’t want to spend money on multiple clippers. It’s practically a high quality product on a budget. 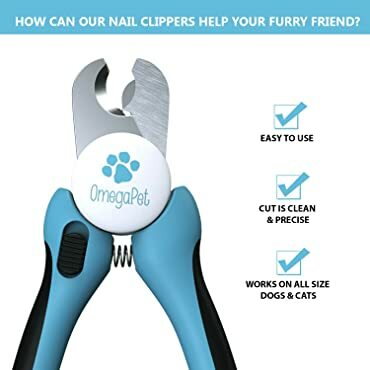 Dog pedicures have never been easier than with OmegaPet’s dog nail clippers. Although the model only comes in one size, it has one of the most comfortable designs around. The rubber no-slip handle makes it extremely easy to use and ensures that even when wet there won’t be any danger of cutting too much of the pet’s nails. Another feature that increases that will allow even owners who have no experience with this process to safely cut dogs’ nails is the adjustable quick sensor. This safety system makes the trimmer perfect for owners who don’t have experience with cutting the nails of their pets. Also, the sharpness of the blades will not only help the user more easily trim the nails, but also make the whole process a lot less unpleasant for the dog. The OmegaPet Nail Clippers also come with an extremely useful nail file that comes out of the handle. This file is strong enough to grind even the strongest nails, but it is also delicate as to not cause any harm to the pet. The manufactures have chosen to use extremely sharp stainless steel blades which require very little pressure in order to make a clean cut and that can be easily cleaned, although they are a bit heavier than others. This might make a difference for some, but we haven’t felt that the added weight could prevent the user from delicately cutting the nails of his pets. All of these features make the OmegaPet Trimmer perfect for anyone who has large dogs as the blades will easily cut through their nails and the quick sensor is extremely well designed. Coming in both small/medium and medium/large, the Epica Professional Pet Nail Clipper is perfect for owners who are looking to buy high quality dog nail clippers for large dogs. The manufactures have specifically designed it in order to accommodate the needs of dogs of all sizes. The blade spacing has been adjusted in order to cut through both small and large nails and the high grade stainless steel used in their manufacturing will ensure that every cut will be clean and easy. The clipper also features a locking mechanism which allows it to be safely stored, and rubber coated handles that are soft yet resilient. One of the most important features of this product is its lifetime warranty. The manufacturers guarantee that none of the parts will break and that the blades will never loose their edge. It is important to note the fact that while the warranty covers the situations where the blades may degrade over time, it is void if the owner tries to use it for anything else but its intended purpose. The Epica Nail Clipper’s guard can be easily adjusted, which makes it ideal for owners who don’t have any experience with cutting the nails of their pets. Still, even with the safety guard, it is important to pay attention to the proper way to cut a nail. Although the manufacturers provide two different sizes for the clipper, they can be used on animals other than dogs. The small/medium ones are perfect for cats, rabbits and other small animals. 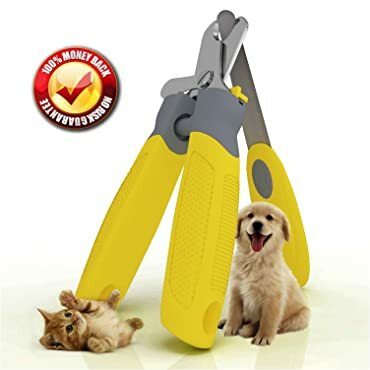 This is a great pair of clippers for those looking for a way to speed through the nail cutting process without compromising the pet’s wellbeing. Advertised as a professional vet quality product, the Trim-pet delivers just that: medical equipment quality. The manufactures have built the blades out of heat treated tempered stainless steel, making them just as sharp as a medical scalpel. Also, the fact that the metal is heat treated means that they will hold a sharp edge for a very long period of time. Not only will you not have to worry about the blades getting dull, but you’ll also always have a razor sharp trimmer at your disposal. Designed for a large workload, the Trim-Pet Clippers feature oversized handles which prevent hand fatigue, as well as a heavy duty conical spring that will make cutting your dog’s nail faster than ever. Also as proof of the manufacturer’s user-friendly philosophy is the anti-pinch telescoping spring guard that will protect the users hands at all times. It is important to note the fact that while the oversized handles are designed to reduce fatigue, they may prove to be extremely impractical for those with smaller hands. While it may not feature a safety sensor, its sharp blades allow owners to quickly cut small pieces of nail in order to get the perfect length, without the fear of painfully crushing them. Unfortunately, this means that the user must have quite a bit of experience in order to avoid cutting the quick. Also, the sharpness of the blades means that once you start cutting there isn’t any turning back. Resco is one of the most popular manufacturers of pet nail clippers. The company has been around for more than 60 years and their products have always been considered to be some of the most versatile on the market. 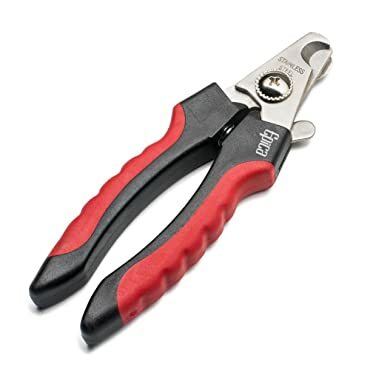 Whether you’re looking for dog nail clippers for thick nails, or for something a bit more delicate, this is a perfect tool to have. The product uses the guillotine style nail trimmer that Resco has invented in 1937 that has been continually refined since then in order to give both the owners and the pets the best possible experience. One of the great advantages of guillotine style clippers is the fact that they can be used on a variety of animals, from large dogs to cats. Unfortunately, the guillotine mechanism makes the clippers impractical for those who don’t have experience, as there is no safety stopper or any kind of guide that can help the user see how much he should cut from the nail. Still, if you have trimmed the nails of your dog before and are used to the activity, you won’t have any problems. The manufacturers offer two sizes of clippers: small and large. Also, the products come with a lifetime guarantee, and it features Resco’s patented blade replacement system which means that if the blades ever loose their edge, you won’t have to buy new clippers, only new blades. You may also like: Dogs Best Joint Supplement For Dogs – A Thorough Purchasing Guide! Its modular design and the great amount of dedication that the company has had when building this product makes it one of the best long-term investments when it comes to pet care. Best Joint Supplement For Dogs – A Thorough Purchasing Guide!